Install GPS vehicle tracking device on School Bus. School transport manager to assign trip route & schedule to school bus and then add students & associated pickup/drop off points to trip. Data on Location, speed, time, driver, student RFID swipes to be sent to back-end cloud servers using GPRS/GSM network. 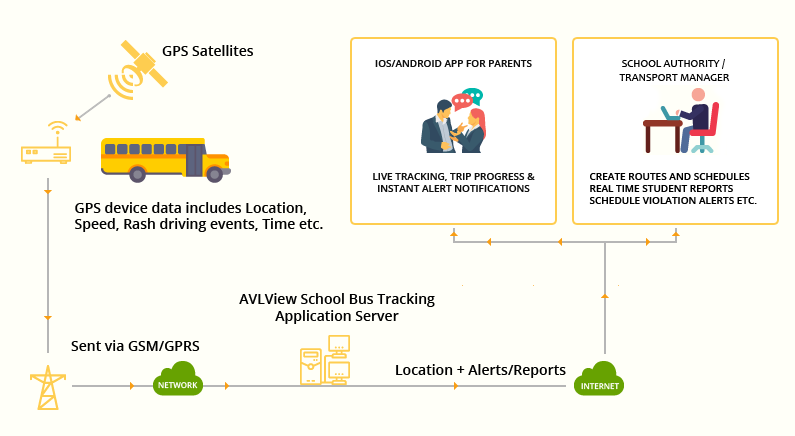 School administration gets bus’ real time location info, alerts/reports and other insights via Web app. Parent can see trip progress real time on map (iOS & Android apps) and gets instantly notified on student swipes (entry/exit) via Email/mobile. Have more questions? Do let us know, we would be happy to help.